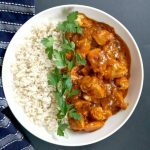 Indian Chicken Curry with Coconut Milk, a quick and easy recipe that is ready in about 30 minutes. The creamy coconut sauce is mild, but heavenly flavourful, and the chicken is tender and cooked to perfection. The perfect midweek dinner recipe for the whole family. Coconut milk features heavily in Asian cuisines. From desserts, to appetizers, mains or sides, there are so many delicious ways of using a good can of coconut milk. Although coconut curries are mostly associated with the Thai cuisine, and less with the Indian food, that does not mean that we can’t prepare an awesome Indian curry with coconut milk. I think the combination of the Indian spices and coconut milk is particulary nice. The sweetness of the coconut contrasts beatifully with the heat coming from the spices. And then you get a whole range of flavours and textures that make this chicken curry with coconut milk a fabulous meal. I used coconut milk in my Chicken Korma, and it was a huge hit with everybody in my family, so I knew that another recipe had to make its way to our table soon. How do you make chicken curry with coconut milk? 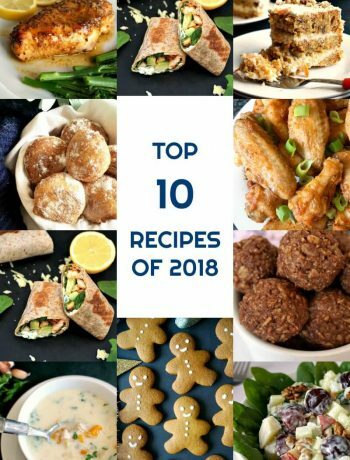 This is by no means an authentic recipe, but mostly made up with the ingredients I had around. That’s what I love about cooking, that I can be as creative as I want, and cook delicious meals without effort. Searing the chicken beforehand is optional, but I think it adds to the flavour, so I highly recommend it. Once the chicken is lightly brown, remove from the pan, and fry the onion. This will soak up all the chicken juices left, and the onion will caramelize nicely. When you add the spices, stir gently for about one minute. The spices will release their full flavour without burning. Add the chicken back to the pan together with the chopped onions and coconut milk, stir, and leave to cook for about 15-20 minutes or until the sauce is reduced and it coats the chicken well. The coconut milk makes the sauce pretty sticky, so I recommend stir gently now and then, to make sure the sauce does not stick to the pan. Can I freeze the chicken curry? Yes, if you have leftovers, just leave the curry to cool compelty first, then transfer it to a tupperware, and freeze. To defrost, you can pop it in the microwave and reheat until bubbly hot. Do not refreeze any food that has already been frozen previously though. Can I use leftover chicken for this curry? Absolutely! 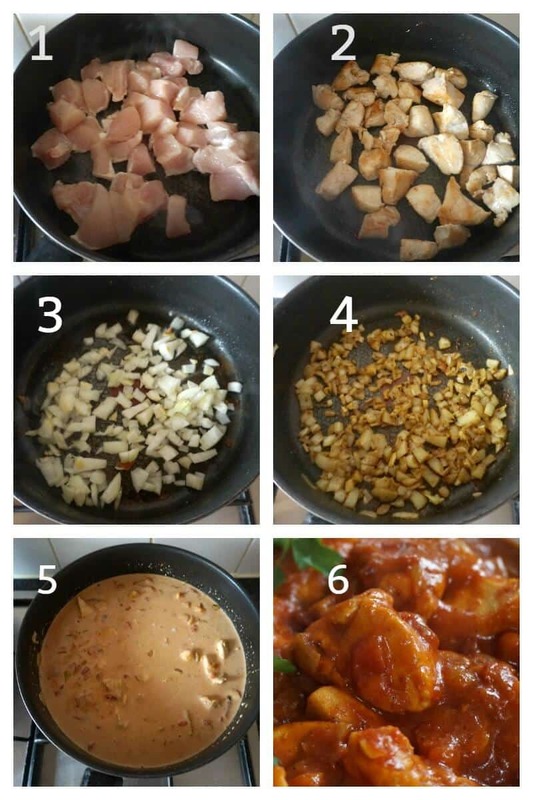 Since the chicken is already cooked, you can just add it at the same time you add the coconut milk and chopped tomatoes, and cook in the same way. Or, if you cook the sauce beforehand, just add the chicken at the end, and allow it to cook for 1-2 minutes with the sauce, so it can soak up all the flavours. 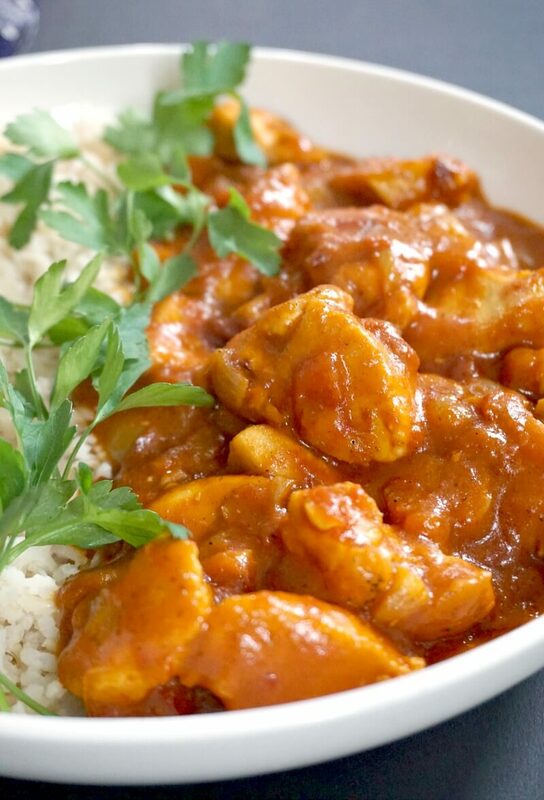 What can you serve with coconut chicken curry ? 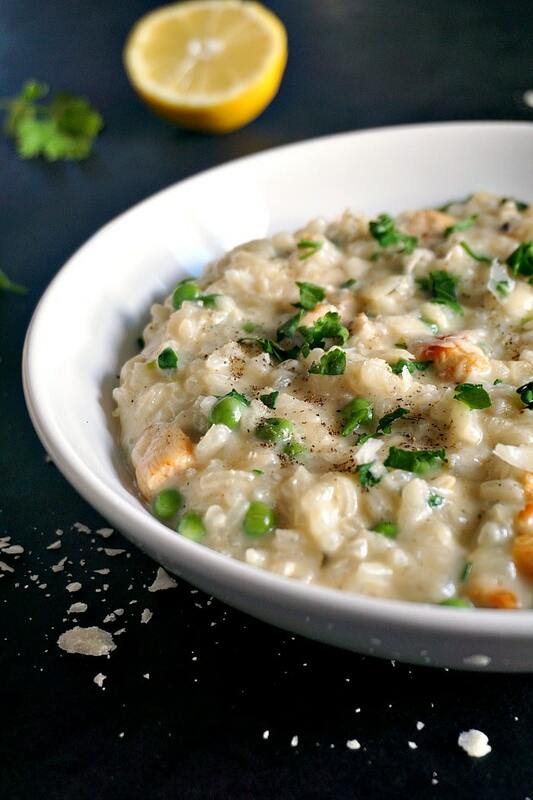 Basmati rice is particularly nice, but wholegrain or long grain rice can also be used. Flatbread, wraps, or any other plain bread are a good choice too. 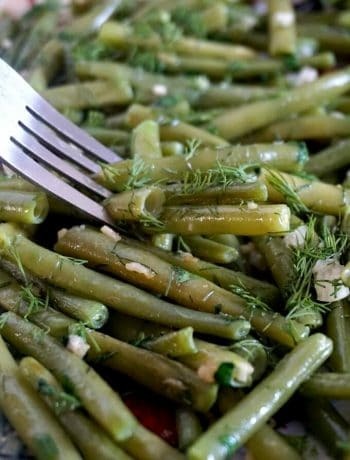 You can have any vegetable on the side as well, since this recipe does not use much vegetables. 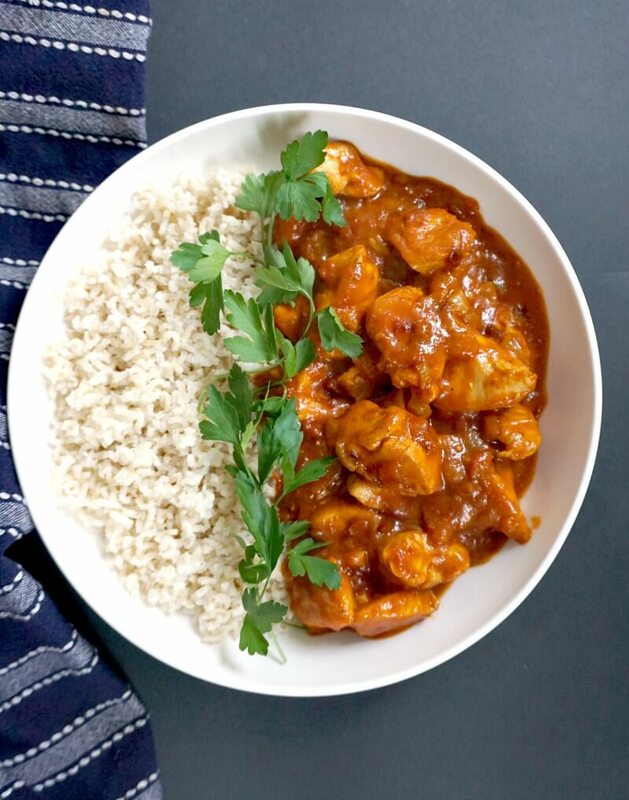 If you’ve tried this INDIAN CHICKEN CURRY WITH COCONUT MILK or any other recipe on the blog then don’t forget to rate the recipe and let me know how you got on in the comments below, I love hearing from you! You can also FOLLOW ME on FACEBOOK, and PINTEREST to see more delicious food and what I’m getting up to. Cup the chicken breasts into pieces, add a teaspoon of oil to a pan, and fry the chicken for about 5 minutes or until lightly brown. Peel and chop the onion, add the remaining oil to the same pan, and gently fry the onion until soft. Add the chopped garlic, spices, and cook for a further 1 minute, stiring occasionally. Add the chicken back to the pan together with the coconut milk and chopped tomatoes, and leave to cook for about 15-20 minutes until the sauce is reduced and it coats the chicken well. Season with salt to taste, and garnish with fresh coriander.